Your organisation is indirectly involved in payments, can only participate in Vendorcom's activities on an ad hoc basis or wants to sample what's on offer before committing to join. Contributing: Your business is an active participant in the European Payments Community and wants its voice to be heard whilst keeping in touch with the latest trends, initiatives and market opportunities. Membership offers free access to all of Vendorcom's core activities: Networking Events, Thought Leadership Conferences, and Special Interest Groups. Collaborating: Your organisation is seeking to lead the way in the European Payments Community and recognises the benefits of a collaborative approach to catalysing change and promoting innovation. You want to be an active shaper, engaging all industry influencers including your peers, competitors, regulators, standards bodies, government and major merchant market organisations. 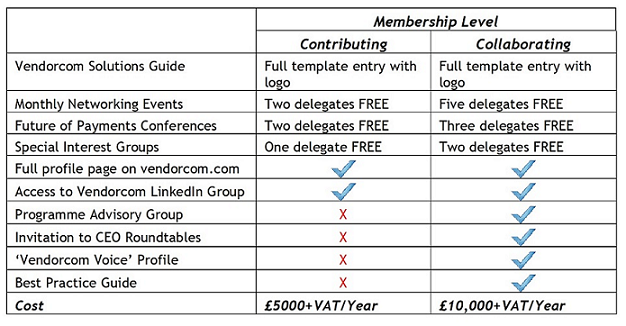 Membership offers the maximum level of engagement across all Vendorcom activities. Corporate Membership is renewable annually based on membership invoice due date. Vendorcom Small/Medium Business Membership is available for businesses with five or less members of staff. For more information on the advantages of becoming a member of Vendorcom or about participating in or contributing our Networking Events, Conferences or Special Interest Groups, please contact Paul Rodgers on paul.rodgers@vendorcom.com or +44 7785 502 605.